Venus exhibiting the so-called “black-drop” effect at second contact, when the planet’s silhouette was first fully within the sun’s disk. This took place at 3:24 p.m. local time on June 5, 2012, with the sun 55 degrees high in the sky. The viewing conditions were not steady that day in Hermosa Beach, Calif., with atmospheric turbulence affecting the quality of the images. HERMOSA BEACH, Calif. — Success from the Pacific Coast! We were able to capture Tuesday's rare, last-in-a-lifetime transit of Venus across the sun here in Southern California, overlooking the deep-blue waters of the Pacific Ocean. We flew in from Boston that Tuesday morning (June 5) and had only about 2 1/2 hours to select an observing site, get there, set up our equipment and have all of our telescopes and cameras ready for the big event. Talk about pressure! Dena Sparks of Hermosa Beach, Calif., shot this scene of the sun and Venus setting behind the Malibu Mountains from Manhattan Beach on June 5, 2012. Sparks used a Canon EOS 7D DSLR camera and 70–200 mm telephoto lens with a 2x teleconverter. Originally, we were planning to observe the transit from Anchorage, Alaska. 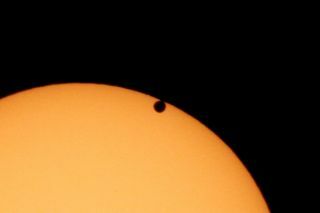 (Alaska and Hawaii were the only two places in the United States where one could observe the Venus transit in its nearly seven-hour entirety.) However, as we were getting ready to book our flight, the weather forecast for Anchorage was not very favorable, so we opted for Southern California. Fortunately, Transit Day on Hermosa Beach was blessed with clear, blue skies, abundant sunshine and a pleasant, refreshingly cool breeze. Back home in Boston, the sky was overcast with periods of rain showers, which had been the situation for the past week. We found a parking spot next to the beach. We immediately started setting up our telescopes on the sidewalk, but the constantly blowing wind caused too much vibration in the camera. So we decided to take shelter in a side street behind a row of condos and use the buildings as a wind shield. It worked! During our observing session, a steady stream of local residents, joggers and cyclists stopped by to inquire about the transit of Venus. We offered them views through extra solar glasses we had brought with us, as well as through our camera viewfinders. Imelda conducts an impromptu lecture about the Venus transit for curious local residents and passersby, offering them views of the event through special solar glasses and the cameras’ viewfinders. They were so excited and thankful for the chance to see for themselves the planet’s tiny disk silhouetted against the sun’s golden orb. People were blown away by the relative sizes of Venus and the sun, which gave them a sense of the immense size of our solar system. One even said that he could now die happy, knowing that he had witnessed the last Venus transit of the century. In addition, we had some lively discussions with them about global warming, climate change and the 2012 doomsday prophecy. But everyone agreed about the need to better protect and preserve our home planet. One thing that amazed us during our trip was the friendliness, generosity and hospitality of the people living along Hermosa Beach. They offered up their front yards, tables and chairs for us — two total strangers from out of town who had set up telescopes on the side of the street. One resident, Dena Sparks, even provided us with a large, bright-orange traffic cone to warn passing motorists of our tripods. We’re so grateful to all of them! As the sun was setting, the wind started to pick up. There was a wind advisory issued that day, warning of high surf and wind gusts of up to 40 mph (64 kph). Since our plan was to photograph the sunset from the beach, we were concerned about salt spray and blowing sand getting into our camera lenses. So we hastily relocated to another spot — nearby Manhattan Beach, which has a tall observing platform overlooking the surf. Unfortunately, by the time we arrived, the sun was already setting, and we didn't have time to set up all of our gear before the sun and Venus disappeared behind the rugged Malibu Mountains of Los Angeles. As the last golden rays of the sun gradually gave way to the rich, crimson hue of twilight, it marked a glorious end to the historic transit of Venus, one that we will cherish for the rest of our lives. A new generation of skywatchers will get their turn to watch this spectacular event the next time it occurs, in 2117. Veteran astrophotographers and transitophiles Imelda Joson and Edwin Aguirre are looking forward to observing the transit of Mercury on May 9, 2016. Follow SPACE.com for the latest in space science and exploration news on Twitter @Spacedotcom. We're also on Facebook & Google+.